Just wanted to share this picture and ask if this looked healthy. This is my first time growing and this particular jar seems to be growing faster than the others. Thanks for the input. Pics are a little blurry but I think you are good. Could be slightly bacterial, but maybe not. If you want an easy way to check the mycelial growth, just mark the outside of the jar with a sharpie at the edge of the growth (it will wash off easily). And check the progress daily. If it is growing below the line, it is still colonizing. If it does not, then you either have a contaminated jar, or the moisture isn’t just right and that section has dried out too much. I was more concerned about cobweb mold than anything. I will mark my jars and see what happens. I do not see cobweb mold at all. But if there is cobweb mold in there, it outgrow the cube mycelium very quickly. Looks good to me! Did you end up prepping everything yourself or get some premade jars? Since this is my very first grow I went with a kit that had the premade jars. I've been happy about everything so far. Very good! I think that's a very good way to start out, lets you learn the basics without getting into too much detail. Or spending tons of money before you see how it goes. Kits certainly have their advantages - namely, you can reuse all the stuff if you decide to go it again, or if you don't experience success, you can try your hand at doing your own substrates. Those jars look good to me. Their looking like mine did ! Edited by Advocate4TheMT, 12 February 2019 - 04:33 PM. Exactly my thought as far as reusing the jars,etc. I should be ready to dunk in about a week or so. You've got some nice mycelial clustering happening there - with the light they're getting you'll probably be seeing pins sooner than later. Everyone has their own methods - I don't dunk before the first flush, preferring to spray the cakes with sterile water & swishing them around with sterile vermiculite, then I lay the cakes on a chunk of foil with damp vermiculite and another layer ~ 1/2 - 3/4 inch on top, that's pretty damp as well. After a good first flush, I dunk and hope for more. Some folks don't sterlize their vermiculite and use it straight from the bag. I PC mine (dry) in pint jars for 30 minutes. Some dampen it and put it in the microwave, but I'm a fan of the pressure cooker . . . something to consider if you're getting antsy and bored and want to play with the PC. Edited by Advocate4TheMT, 13 February 2019 - 03:51 PM. PF as bulk innoculant is a great way to get started "beyond PF." It's how I made the transition. 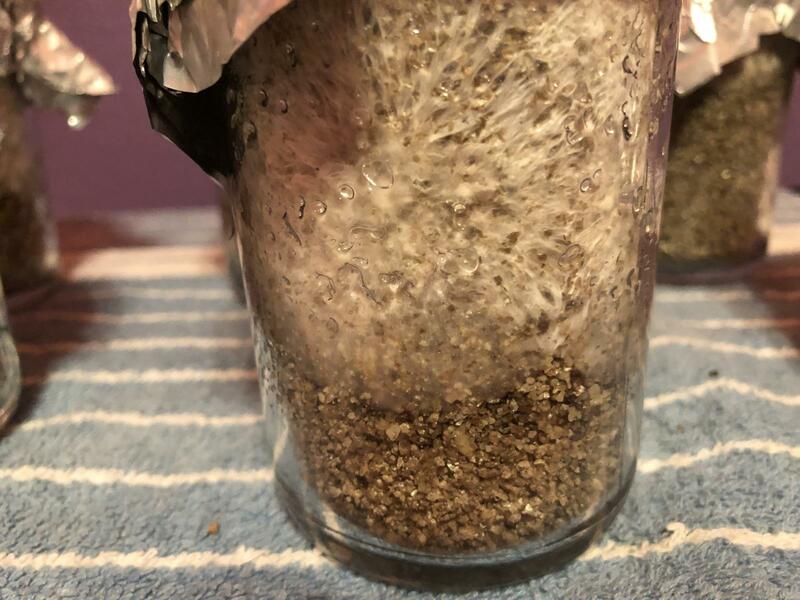 If this is your first grow, you may consider holding some of those 1/2 pints for standard PF. Or not. Many ways to skin this shroom. 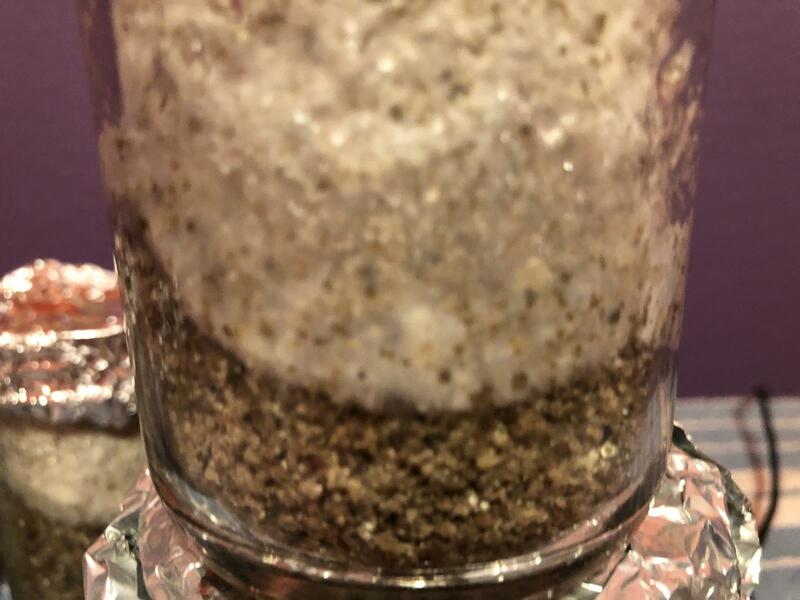 I’m using 650 grams coco coir with 4 cups of vermiculite mixed in a 5 gallon bucket with 8 cups of 170° water then sealed over night. It opens up at perfect field capacity. Edited by Advocate4TheMT, 13 February 2019 - 05:22 PM. Edited by Advocate4TheMT, 19 March 2019 - 11:00 PM.